1. Cut a length of lace that will be longer than the candy cane. 2. 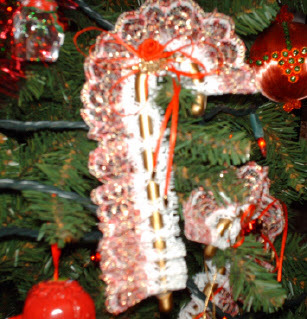 Thread the candy cane through the holes in the lace. 3. Glue the ends of the lace to the ends of the candy cane to hold it in place. 4. Glue decorative accents such as smaller ribbons, miniature holiday ornaments, etc. along the length of the candy cane and lace. Copyright © 2007 by Kristen. All rights reserved.